I am a beginner, still do not understand how it works, although lately the net every day looking to learn everything about SEO. For several days I found your site and I hope it was my turn on the light in the darkness in which I am yet. I hope here to understand step by step what to do, because Note that SEO is quite complex. Not yet understand the steps on page SEO actually do not understand multesi say that even if the link is silly, with the hope that I can apply or explain why not to one like me in the future. I am looking for DIY SEO Solution. Dan, I hope your guide will deleiver me what i wish. I want to Thank you for all your efforts. Dan, great stuff! I know I don't need to tell you there are maybe thousands of SEO snake-oil salesmen out there, but here you seem to have got it just right. Not too technical, but not the cheesy adverblurb hype like in your videos (bleeeaarch!). Question: How about a level 2 - Pros Only or Advanced section? Anyway, thanks for sharing. I'm really happy to see this course! It was recommended to me by a successful internet marketer. This looks like some of the best material that I've seen online for SEO. I've spent some thousands of dollars on internet marketing training, but I'm impressed with what I've seen so far. Thanks for this information. I have just read the introduction. If the rest of the guide delivers, I think my long exhausting search for answers is over. Well looks like I have some reading to do. Will update comment after I am finished reading the guide. I have some business relevant sites, so I want to do 3 way link using my websites, the link page PR from 1 to 6, and I need your link page pr 1 and more. If you like that kind of link, send me your email to businessseo6@gmail.com. We also can talk with gtalk. I think it's fantastic to have your SEO guide to help me! I truly need it. I am brand new to the the whole IM venue and am looking forward to learning the info you have so generously provided. I am a stay at home mom whose expertise with the computer is limited to email and surfing the web. Because of this, I consider myself to be a challenge in teaching any type of the much needed skills to succeed in any way online. Thanks again for providing SEO In Practice (especially for FREE)! I will certainly let you know how it's going. I better go get started now....I know I have a lot to learn! I hope the guide will be helpful! I've tried tmy best to make SEO as easy-to-grasp as possible. Thanks, Dan, for the welcome. So far the SEO guides have been easy to understand and a real help for people in my position, starting a newbie. I am stopped right now at the section that asks for a website address. I don't have one yet. I am in the process of getting a domain, but I was thinking that I am going to have to wait until I actually have content on the site. Is that correct? Thanks again for SEOInPractice. It really does make things more clear. I was suffering from information overload and couldn't put it all together. Thanks for making that possible! I first heard of SEO a month ago. I then brought on a consultant to help SEO my son's website. In order to understand and assist the consultant I was determined to learn about SEO. I am a writer and have learned such skills are valuable assets in SEO. Attempts to educate myself were a good start but it was slow going. 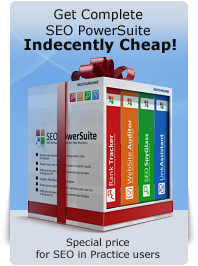 My consultant recommeded SEO PowerSuites as a tool we should use. Soon I discovered your guide. The initial impact is like being plugged into a light socket. I read your table of contents and am energized about learning the SEO information that you have packaged for total newcomers like me. Wanted to share my first impressions. Now back to study.